I recently had the opportunity to purchase the Sew Easy Tool made by We R Memory Keepers. I had used my sewing machine for stitching on my scrapbook pages, but it was inconvenient to take my pages into my sewing area and I didn't like the fact that sewing through paper always dulled my needles. So when this product came out, I jumped at the chance to give it a try and liked it so much, I went back and purchased the entire set of 6 alternate heads, the cutting mat, and storage box to hold all of the goodies. With the Sew Easy Tool, you can add stitching to your Scrapbook Pages and Cards without having to use your sewing machine. This hand tool has an interchangeable rotary piercer head, that punches holes in paper and card stock in a number of designs. These holes, just like the holes from your sewing machine, are aligned perfectly. They can then be stitched by hand just like going over an embroidery pattern on fabric. Not really interested in stitching? You can also use these evenly spaced holes to mark out a pattern for brads, eyelets or gems. The piercing head that comes with the tool pierces a straight machine or running stitch that can be a straight or curved, single line or multiple lines. The stitches can be all the way across or alternating, every other stitch. To switch out the Interchangeable Heads, just twist the head and pull out. Then pick the head for the pattern you want to use, push it in and twist to lock in. 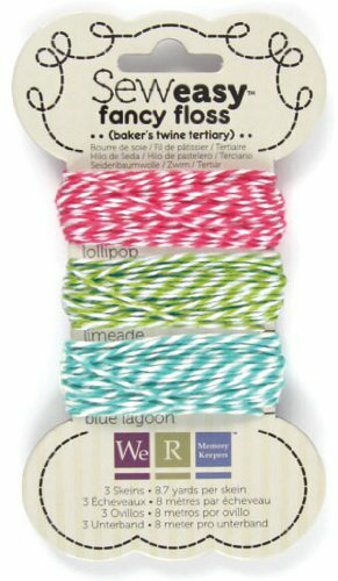 Some great new accessories have recently been introduced in the We R Memory Keepers Sew Easy line. First up is the Starter Kit with One Tool Handle, 5 inter-changeable heads (three regular size and two large), an assortment of 8 beautiful threads, and a cutting mat to insure thorough piercing of your holes for your craft project. 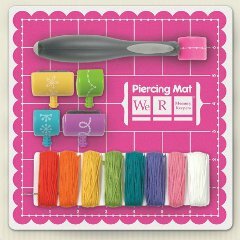 If you already have some of your Sew Easy tools, you can now purchase the great little Piercing Mat to put under your work to make those pierced holes just perfect. 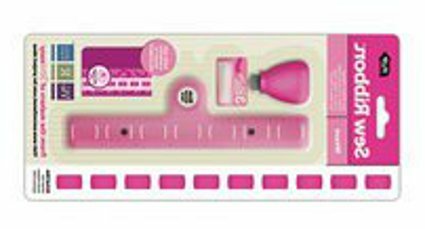 This great ruler has ends the fit very nicely over the edges of your Sew Easy Piercing Mat. This is great to use when you want these stitching lines to be straight. 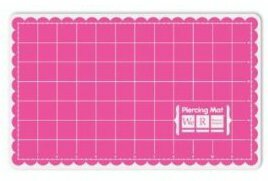 Just align your paper on the piercing mat along the lines printed on the surface. Place the Sew Easy Ruler over the mat with the ends of the ruler over each edge, press and hold the ruler down to secure your paper. You are then ready to roll the Sew Easy Tool over the paper up against the ruler and you have your pierced image in a straight line. Already have you collection of Sew Easy Heads? Here's the perfect storage for your collection as this box holds 26 of the replacement heads for your Sew Easy Tool and the Tool itself with one of the inter-changable heads. It doesn't matter if you have the large or the small heads, this storage holds both sizes for your complete collection. 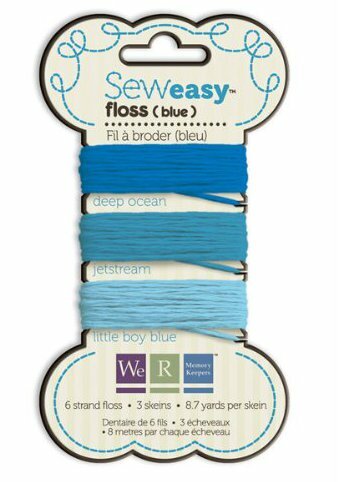 Just like it's name, the Sew Easy Tool is easy to use. You just roll the tool over the paper. For best results use the Piercing Mat underneath which will provide more defined holes. You may wish to make a curved or wavy line, but if you want it very straight, I would suggest placing the tool up next to the edge of a ruler and using that as a guide line. Shortly after I got accustomed to using my Sew Easy Tools, We R Memory Keepers came out with the Sew Ribbon Tool Stencil. These tools allow you to cut slots in various shapes and angles to thread ribbons through. The slots all take ribbon that is 10mm or about 3/8" wide. This is such an easy way to add some additional ribbon designs to your cards and scrapbook layouts beyond the ribbons on the tags, bows and straight pieces of ribbon. 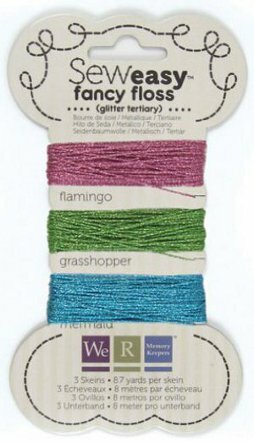 Each package comes with a 2-piece magnetic template; matching cutting blade, and three ribbon needles that work somewhat like a sewing bodkin, allowing you to have an end to your ribbon that will allow it to thread through the holes without fraying. It's a little like the end on a shoe lace. To Align, place the top template over your paper or card stock, and align it to where you want your ribbon accents. Then slide the bottom portion of the template under neath. The magnets will insure that your template pieces fit together properly. To Cut, using the color coordinated cutting tool, align the curve of the cutting tool with the curvature of the holes in the template. Gently press down through the template until you are sure the cutting blade is properly in the slot. This may be a little difficult to do initially, but it will get easier. Press down to cut the slots at the correct spacing and correct angels for a great pattern for threading the ribbon. I have been cutting only through cardstock, and the blade makes a little snap when it cuts all the way through. You are all the way through the cut when the handle of the cutter is flush with the template. I found that I could hold my cardstock with the template attached up to the light just to verify that I had cut through all the slots completely. To Thread, place the ribbon in the ribbon needle and draw through the slots to form the pattern. Don't worry, all the directions come with the package, but it's very easy. Currently there are 6 patterns, sold individually or in groups of 2 or 3. Each uses ribbon that is 3/8" or 10mm wide. The current patterns are Weave, Flower, Scallop, Leaf, Shoelace and Zig Zag. 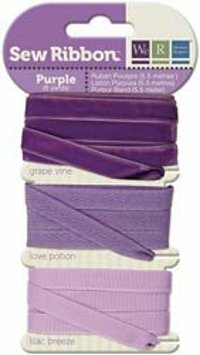 Ribbon for your Sew Ribbon Tool comes with 3 colors per card all in the same color family with one yard velvet ribbon, one yard grosgrain and one yard twill. 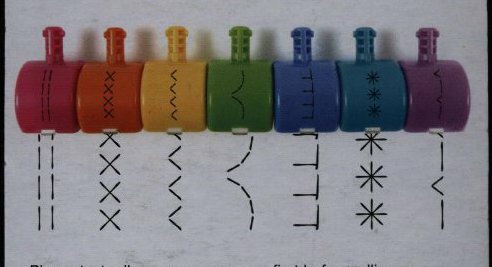 The Stamper Tool, also from We R Memory Keepers is the solution if you want to create the “sewn” look, without the sewing. The Sew Stamper Tools is a combination of sewing and stamping that will do just that for you. It works just like the Sew Easy but has a self-inking rubber rolling stamp! This is just as easy to use as the Sew Easy Tool, but before using you will need to roll back the little cover over the stamp head to expose the self inking stamp and pad. It will lock open. Roll the tool across the paper or card stock and you have a stitched image. After using, roll the little cover back over the stamping head and snap it closed. The various stamping heads can even by used on the same hand tools as the Sew Easy heads. The first tool that I purchased was a double line straight stitch and there are also stamping heads the come in the same designs as the Sew Easy Tool. The Stamping heads are currently sold separately or in a kit that has the same 6 additional designs as the original Sew Easy - Criss-Cross, Zig-Zag, Scallop, Hem, Burst and Blanket Stitch. The literature states that Each Sew Stamper attachment head will make over 1,000 impressions. I have not used mine that much yet, but I can tell you the little ink pad, which is currently only black, is a very juicy one. 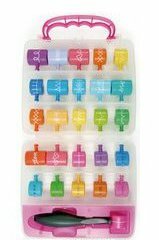 The complete Sew Easy Kit, comes with a storage box that is designed to hold a pair of scissors and the handle kit with one head attached, room for 8 other heads (fits both large and small) and a larger compartment to hold the flosses. The floss packages from Sew Easy have a hole in one end and the storage box comes with a strap with lobster claw hooks on each side to attach to the box to hold all floss cards. I also store my ribbon packages here as well and the cards that I have shown here with the alternate designs. There is also a smaller container to hold needles and the back end of the handle also opens for needle storage if you don't have the storage box. Under neath the needle case in the storage box is another opening that I store my ribbon threaders from my Sew Ribbon Tools. The lid of the storage box is designed to store the 8" x 13" We R Memory Keepers Piercing Mat that allows your piercers to perfectly complete the holes. I hope this review has helped you understand how the Sew Easy Tool, the Sew Ribbon Tool and Sew Stamper Tools work and how they can help you to easily enhance your Scrapbook Pages and Cards. All three of these are easy to use. 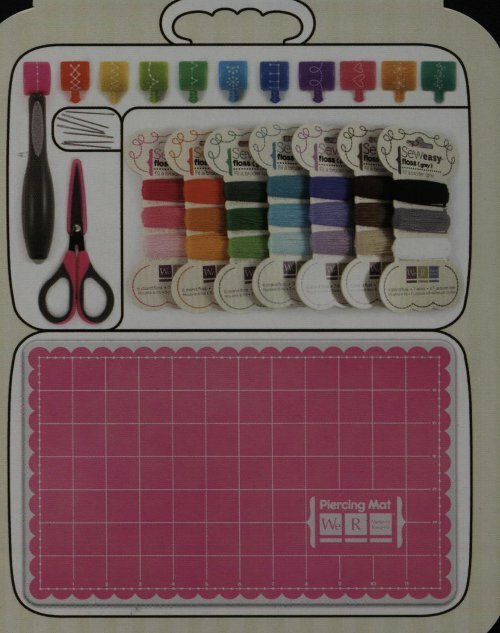 Below, I have included a store store that you can look more closely at the Sew Easy Tool, Sew Ribbon Tools and Sew Stamper products and purchase them if you wish. When you purchase from this page, you are actually purchasing from Amazon.com. All orders go through Amazon's secure order server. If you have any questions, please Contact Us. from the Sew Easy Tool review.